This is where you can find Public Safety’s latest news and updates. Please visit this page regularly and feel free to contact our department with any further questions or concerns at (425) 564-2400. Visit the Bellevue Police Department Crime Map to see what is happening in and around Bellevue College. The college has established the following procedures to help prevent or minimize injury to BC students, employees and visitors in the event of a fire, medical emergency, earthquake, or other crises. Students and employees are encouraged to review and learn the steps for each emergency scenario, as well as familiarize themselves with the location of all first-aid equipment, manual fire alarm boxes, and fire extinguishers. The emergency maps posted in classrooms, offices, and stairwells point out the location of these items as well as the evacuation routes and assembly areas. Employees at college sites other than main campus should call 911 first and the BC Public Safety office second in any potentially life-threatening situation. Campus roadways, parking lots, paths, and buildings cannot be maintained for public safety. The Public Safety Department initiates the closure decision process when weather conditions begin to worsen. The Vice President of Administrative Services and the President are involved in making a decision to close campus. Total closure—Classes will not meet and offices will be closed. Essential personnel may be asked to report to work if possible, but otherwise no faculty, staff, or students should be on campus. On-campus notifications (if a decision to close is made during the day): The President’s Office or the Vice President of Administrative Services sends an e-mail to BC network users. Public Safety will immediately notify instructors and students in classrooms. Rave Alerts (BC’s emergency notification system) – BC will send an e-mail and/or text message as soon as possible when the college closes due to weather or any other emergency. Sign up for this service here. This system receives the highest priority among several channels the college uses to communicate emergency messages to students, faculty, and staff. FlashAlert – BC (and many other Puget Sound area schools) posts emergency communications on the FlashAlert website. This is the source the media uses to get their closure information, and will be BC’s second priority in disseminating emergency messages. You may subscribe to FlashAlert’s email and text message service here. Most TV and radio stations broadcast these messages periodically. Please remember, TV and radio stations do not name schools that will be staying open. If BC is not mentioned, assume that classes will meet and offices are open. BC’s emergency hotline message – Call (425)401-6680 for emergency information, including campus closure information. BC’s home page – If campus is closed, the College’s website will provide information on the closure. If the college is staying open, faculty, and staff are expected to make a reasonable effort to come to campus and maintain services for students. However, the College does not expect people to put themselves in danger. If there is a weather emergency, use your best judgment to determine if you are able to make it to campus. Check traffic advisories and other information resources to make an informed decision based on your local conditions and circumstances. Ensure that proper department protocols are followed for calling in absent when you are unable to make it to campus. If you are indoors, stay indoors. Take shelter under a desk or table, cover your head and neck with one arm, and hold the leg of the desk or table with your other arm. If you cannot move under a desk or table, stand along an inner wall and cover your head and neck with your arms. If you are in a wheelchair or unable to stand along a wall or take shelter, move as close as you can to an inner wall and cover your head and neck with your arms. Move away from windows, glass walls, doors, and unsecured falling hazards. If you are outdoors, stay outdoors. Move away from overhead electric wires, poles, buildings, or anything that may fall. Crouch down, if possible, and cover your head and neck with your arms. Remain in your sheltered area until the shaking stops, then proceed to your nearest or safest evacuation zone. Avoid areas near gas mains. Assist others in need and provide aid if you are qualified to do so. Wait for further instruction before returning to buildings. Be prepared for additional aftershocks, which may be as strong as the initial earthquake. Sometimes, an initial earthquake may be a foreshock that is followed by a stronger earthquake. When provided with the approval to return to buildings, be extremely careful and remain aware of your surroundings. Do not use any open flames until advised that there are no gas leaks. Stay away from fallen or damaged electric wires. If there is a fire or serious injury, follow the instructions given for that hazard in these emergency procedures. The nature of the injury or medical problem if the person has been able to tell you what is wrong. If 911 has not been called and Public Safety deems it necessary, an Officer or dispatcher will call for aid. A Public Safety Officer will arrive at the scene as soon as possible. Do not leave the scene or leave the injured person alone. If there is no or little natural light in the area, evacuate to an area with natural light or your nearest and/or safest evacuation zone. If there is a fire or other emergency associated with the power failure, follow the appropriate procedures. Public Safety, the Vice President of Administrative Services, and other members of the President’s Cabinet will make a determination on closures or other arrangements for long-term power outages. If you hear a fire alarm, leave the area immediately and follow the evacuation procedures to your nearest or safest evacuation zone. Remain in your evacuation zone until otherwise directed by Public Safety or Fire Department personnel. 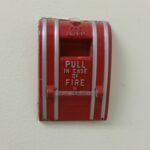 Pull an evacuation alarm pull station for the building. Each building has multiple pull stations, which will activate the evacuation alarm. If the fire is outside and not near a building (bark or bush fire), avoid the area and try to prevent others from entering the area as well. Call 911 and provide them with your location, the location of the fire (building and room), the telephone number you are calling from, and the size/type of the fire (example: large trash can fire or small electrical fire). Call Public Safety at (425)564-2400 or ext. 2400 from a campus phone and provide them with the same information. If you are trained in the use of a fire extinguisher, you may attempt to extinguish the fire. Remember, your safety comes first. If extinguishing the fire puts yourself or others at risk, evacuate the area. Do not re-enter the building until you are authorized to do so by Public Safety or emergency personnel. Remain calm. Walk to your nearest exit – do not run. Assist others in need if you are able. If you are on an upper floor, take the stairs. Do not use the elevators. If you are unable to take the stairs, many buildings have emergency evacuation chairs available for use near the stairwells. Those who cannot use stairs should proceed to a stairwell or designated area of refuge for evacuation assistance. If you are a student with access or functional needs, the Disability Resource Center is available to assist in emergency planning. You may contact them at any time at (425)564-2498 or ext. 2498. If you are an employee with access or functional needs, Public Safety and Human Resources can assist in emergency planning. You may contact Public Safety at (425)564-2400 ext. 2400 or Human Resources at (425)564-2274 or ext. 2274. Evacuate to the outside of the building, toward the parking areas. If you are on the main campus, do not evacuate into the central courtyards. Designated evacuation zones are available for use. It is important to note that your nearest evacuation zone may not be the safest depending on the circumstances. Use your best judgment to decide which zone to evacuate to. Do not re-enter the buildings until you are directed by Public Safety, Law Enforcement, or the Fire Department. If main campus is evacuated, please use a “right-turn only” method. Turning left at stop signs can prevent traffic flow. Continue right-turns until you reach an exit to prevent traffic congestion and allow for responders to enter campus easily. RUN: Have an escape route/plan in mind; leave belongings and vehicles behind; and keep your hands visible. HIDE: If you cannot run, hide in an area out of the shooter’s view. Block entry to your hiding place, lock doors, and silence your electronic devices. Do not go near windows and close blinds if possible. Stay hidden until help arrives. FIGHT: Attempt to incapacitate the intruder; act with physical aggression, and throw items at the intruder. This is a last resort. Once you are in a safe location, call 911. Do not assume someone else has called. 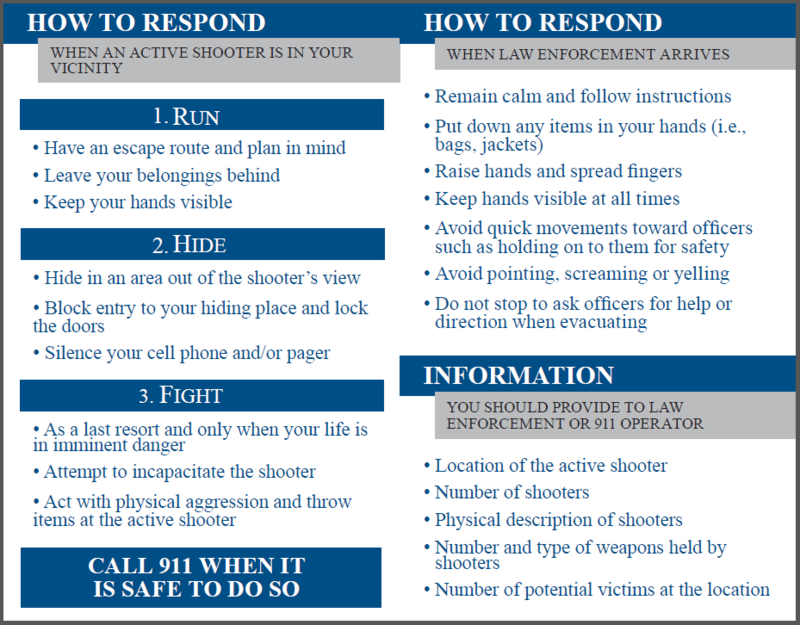 When there is a violent intruder on campus, it is extremely important that you follow the instructions of law enforcement personnel. They are there to help, but their goal is to neutralize the threat. Follow any and all instructions; keep your hands clearly visible; and avoid pointing and yelling. For more information on the “Run, Hide, Fight” method for violent intruders, click here. Contact Public Safety at (425)564-2400 or ext. 2400 and provide them with any information you have (type of substance, location, call back information, etc.). Turn off any electrical equipment, especially fans. If the material is indoors, open doors and windows. Evacuate the area of the spill or release. Attempt to prevent others from entering the area until help arrives. Do not touch, smell, or ignite flame near the substance. If you are exposed to the material or have come in contact with it, let responders know. If those exposed to the material exhibit any signs of illness or injury due to the substance, call 911 immediately. In case of a hazardous material release or spill near campus, it may be necessary to shelter in place. Public Safety will notify students, faculty, and staff if this occurs and provide instruction. Follow any instructions from Public Safety or emergency personnel. If you are asked to evacuate the building due to a hazardous materials spill or release, proceed to your nearest or safest evacuation zone. If you are asked to evacuate campus, please follow the campus evacuation procedures and use a “right-turn only” method. If you notice a suspicious person, it is important to secure your own safety and the safety of others around you. Call Public Safety at (425)564-2400 or ext. 2400 and provide as much information about the individual(s), including their location, physical description, and explanation of why they seem suspicious. Do not confront the person yourself. It is important to note, what makes one person feel as if someone is suspicious may seem normal to others. If you feel as if a person is suspicious in any way, you may notify Public Safety to investigate. Call Public Safety at (425)564-2400 or ext. 2400. Provide any information you have about the package (location, type, physical description). Do not operate any electrical equipment or use open flame around the package. Prevent others from touching or disturbing the package. Follow any instruction provided by Public Safety. If you are told to evacuate, move to your nearest and/or safest evacuation zone and await further instruction. Any lisp or a regional or foreign accent? What kind of bomb is it? What is it made of? If you receive a bomb threat in any other way, collect as much information as possible to you at the time, call 911, and then notify Public Safety at (425)564-2400 or ext. 2400. Relay the information you gathered from the caller or threat. Follow any and all instructions by Public Safety and/or Law Enforcement personnel. Be prepared to evacuate the area. Remember that your safety always comes first and try to assist others in need.